The tower is being built on the Mull of Chonhar. Ukraine has started construction of a 150 m tower for the organization of the FM radio broadcasting to the Russian-occupied Crimean peninsula, deputy Minister for the Occupied Territories Heorhiy Tuka and deputy minister of Information Policy Artem Bidenko reported in a joint statement on 2 December. The tower is built on the peninsula of Chonhar. 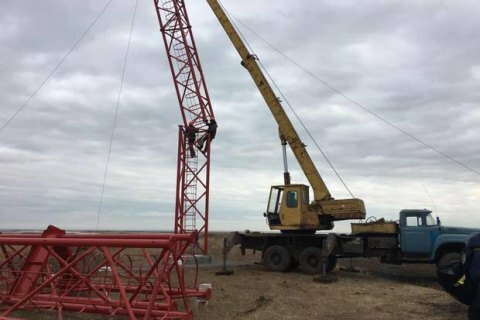 The construction of radio and television transmitting tower on the Mount Karachun near Kramatorsk was completed in November. It was has not been commissioned yet.